Give today to make a difference in the lives of people living with Ehlers-Danlos Syndrome. Help us build a new infrastructure for discovery, treatment, and community—globally. Our inaugural years as The Ehlers-Danlos Society have been the most productive in over three decades of history as an organization. 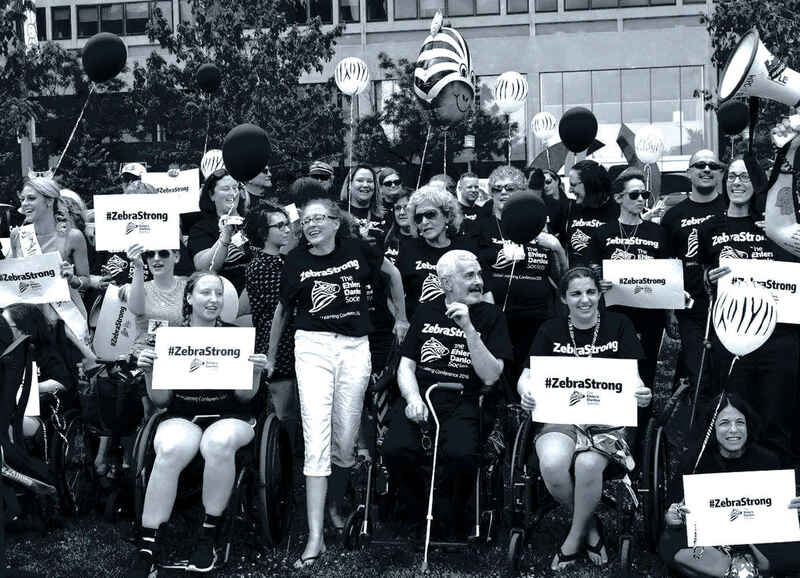 We have come a long way since our 1985 founding by Nancy Rogowski as the Ehlers-Danlos National Foundation. From our first biannual Ehlers-Danlos International Symposium—where over 200 medical professionals gathered to refine the nosology, diagnostic criteria, and treatment protocols for the entire range of Ehlers-Danlos syndromes—to our annual Global Learning Conference and establishment of our new eminent medical and scientific board, we've made great strides in the advancement of Ehlers-Danlos research, awareness, advocacy, and patient care. With investments of thousands of donors throughout the world, we are building a new infrastructure for discovery, treatment, and community—globally. As we strengthen, our future brightens. Together, we envision a day where early diagnosis means better management and even better patient outcomes. Across a not-so-distant horizon, we picture ever more productive, energetic lives, enveloped by the light of mutual support; steeled against pain; and steadied by the help of medical professionals fully steeped in their knowledge of Ehlers-Danlos and all of their comorbidities. Join us. Help build the first-ever International Ehlers-Danlos Patient Registry. Help unlock the genomic secrets of Ehlers-Danlos and their multi-systemic effects in areas ranging from gastrointestinal, autonomic, mast cell, and neurological complications, to fatigue and chronic pain. Together, we pray for the day when no child of Ehlers-Danlos comes into the world without the full support of well-informed, properly trained health professionals providing a world class standard of care. At The Ehlers-Danlos Society, our strength begins with hope. Join us. Regardless of your level of support, our hope begins with you. We are making this donation in Jamie Beckman Gorton's name. She died of this and so did her mother. In memory of Jamie Gorton. In memory of Jamie Lynne Gorton. Barrett Roofing. In honor of my cousin Cindy Lyon's ongoing struggle! This donation is being given in memory of Jamie Lynne (Beckman) Gorton. A loving daughter, mother and wife. For all the brave souls that struggle with Ehlers-Danlos Syndrome every day. Proud to know you are staying strong. Keep the conversation going. My husband and two of my children have EDS. I know how difficult the medical issues are. We are giving this donation in memorial for : Jamie Gorton who passed away on Tuesday, April 9, 2019. In memory of Jamie Gorton on behalf of the Ridgefield Board of Education.